To ensure the best results, start with clean, dry fingernails. Do not use any hand creams, lotions, or sunscreen on the day of application. Use the buffer or nail file to gently "rough" up the surface of your nails, removing all shine from the surface. Surface oil on nails will keep the product from adhering properly. Some women produce more oil in their nails than others, please make sure to prepare the surface of your nails as instructed. Push back cuticles with the included cuticle stick. Dust off the nails with a dry, lint free wipe (such has Kleenex Tissue). Gently shake the polish to distribute contents evenly in bottles. We suggest that you always start with your thumb, completing each coat before moving on to the rest of the hand. This will keep polish from pooling at the cuticle of your thumbs. Step 1. Start with clean, dry nails. Apply a thin coat of Savvy Girl Gel Nail Polish Base Coat. Make sure to seal the edge of each nail with the Base Coat to keep moisture from penetrating under the finished polish. Note: Remove any excess polish from the cuticle or skin with the cuticle stick or nail art brush. This is a very important step to keep moisture from penetrating under the finished polish. With our polish less is more. Wipe excess polish from brush into bottle before applying product to your nails. Cure Base Coat under the LED light for 30 seconds. Step 2. Apply a thin coat of Savvy Girl Gel Nail Polish Color. Make sure to seal the edge of each nail with the Color to keep moisture from penetrating under the finished product. Again, less is more. Wipe excess polish from brush into bottle before applying Color to your nails. Remove any excess polish from the cuticle or skin with the cuticle stick or nail art brush. This is a very important step to keep moisture from penetrating under the finished polish. Cure Color under the LED light for 30 seconds. Note: Many of our colors need only one coat for a rich, even finish. For darker coverage, repeat Colorapplication steps to apply a second coat of polish. Please note that our polish is "self leveling" and will cover any ridges you may have in your nail surface. Step 3. Apply a thin coat of Savvy Girl Gel Nail Polish Top Coat. Make sure to seal the edge of each nail with theTop Coat to keepmoisture from penetrating under the finished product. It is important to make sure that you apply Top Coat over the entire nail surface. Again, less is more. Wipe excess polish from brush into bottle before applying Top Coat to your nails. Remove any excess polish from the cuticle or skin with the cuticle stick or nail art brush. Cure Top Coat under the LED light for 30 seconds. Step 4. Important: Remember to cleanse your nails with at least 70% Isopropyl Alcohol, or Savvy Girl Cleanse product - after the final cure under the LED light. Apply the alcohol or Cleanse to a lint free wipe and thoroughly clean the surface of each nail. This will remove the tacky residue from the Top Coat and achieve the shiny, hard, diamond like finish! Note: Your nails will not harden properly until the alcohol or Cleanse has been used to clean each individual nail. Step 1. Using a nail file, gently "break" the surface of cured top coat. This is only necessary to do in a small area on the surface of each fingernail. Note: It is necessary to break the surface of the top coat so that the acetone or Remove product can penetrate into the lower layers of product, making removal faster. Step 2. Saturate cotton area of Savvy Girl Gel Nail Polish Removal Wrap with our Remove product, and place cotton area directly over fingernail. Firmly wrap foil portion of Removal Wrap around finger, making sure to keep saturated cotton area firmly over fingernail. Continue with each individual nail. *You may also use cut aluminum foil strips with cut portions of cotton pads, and saturate cotton pad with pure acetone. Note: Using a heat source, such as a heating pad or microwavable heat pad applied to the wrapped nails will speed the removal process. Step 3. After 5 - 7 minutes check the progress on one nail by gently pushing at the polish with a cuticle stick. If the polish moves easily, it is ready to remove completely. If the polish is not moving easily, re-wrap the nail and leave covered for an additional 2 -5 minutes. When polish has softened, use a rubber or wood cuticle stick to gently remove any stubborn bits of polish from nails. Follow with cotton ball or tissue soaked in Remove product, or pure acetone to ensure all product is removed. 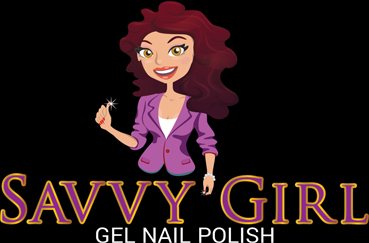 Your nails are now ready for a new Savvy Girl Gel Nail Polish manicure!